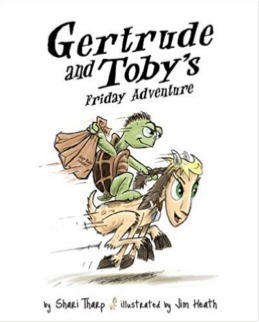 Gertrude the goat and her best friend Toby the tortoise are adventurers. No sitting around on the boring farm for them! They love to explore, and every Friday they sneak off the farm for some extra fun. One Friday, Gertrude and Toby decide to visit the local candy store in town. They discover yummy goodies and treats, but soon find that the treats are not free!? Uh oh! The market owner grabs Toby. He demands money for the candy that Gertrude and Toby have taken by mistake. Gertrude must find a way to save her friend and get back home before Farmer Sam returns. FTC Disclaimer: I received this book free to read and review, thanks to Shari Tharp. I really enjoyed this cute little story. It was adorable, and I just loved the aspects of fairy tales that were added in. I would highly recommend this book for adults with young children. It would definitely be the book that I would read to younger family members or children that I babysit because it is a wonderful little story, with characters children could love. It's the kind of book that children could even possibly find funny because it has that hint of silliness about it, which is what makes it such a cute read. The illustrations were wonderful, and I just think they added a nice touch to the story.